In the world of independent podcast networks, companies such as Gimlet Media (Startup, Reply All, Heavyweight), Earwolf (Comedy Bang Bang, How Did This Get Made), Maximum Fun (Bullseye, Judge John Hodgman), and Nerdist Podcast Network (You Made It Weird, Nerdist) would usually be described as the heavy hitters. Not too far behind them would have to be Feral Audio. 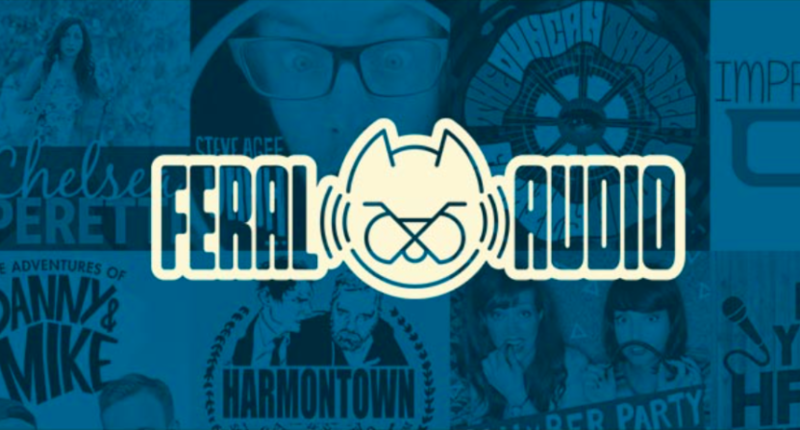 Feral, which was founded in 2012 as a podcasting collective by Dustin Marshall, has always prided itself on being the “Fiercely Independent Podcast Network” that gives its show creators complete ownership and creative control over their content. Their lineup isn’t huge but over the years, its shows have featured some pretty big names in comedy, including Dan Harmon (Harmontown), Randy and Jay Sklar (Dumb People Town), Chelsea Peretti (Call Chelsea Peretti), duo Mike Mitchell and Nick Wiger (Doughboys) and duo Karen Kilgariff and Georgia Hardstark (whose My Favorite Murder started here, but left for Midroll Media in September). Per their Wikipedia page, one of Feral’s claim to pop culture fame is that they were the first podcast network to have a panel in San Diego Comic-Con’s Hall H (the massive one where all the big movie trailers get premiered). Given how the podcasting business has been growing exponentially and seems ready to boom once more as bigger companies and advertisers start to get more involved, all signs pointed to a very bright future for networks such as Feral Audio. With a handful of successful shows with strong audience followings, it seemed a foregone conclusion that the network would keep growing and expanding. All of that changed Wednesday, however, when news broke that Feral Audio would be shutting down at the end of the year following an accusation of emotional abuse against founder Dustin Marshall. The charges stem from ex-girlfriend Abby Weems, a member of the punk band Potty Mouth, who posted the allegations on Twitter last week. Weems says she dated Marshall for most of 2017 and while he was charismatic at first, he later became unpredictable and intimidating. She claims Marshall, a heavy drinker, would verbally abuse her and insult her to the point of tears. It got so that she altered her entire life in an attempt to avoid violent confrontations with him. She also notes that Marshall is open about having Borderline Personality Disorder, a mental illness marked by an ongoing pattern of varying moods, self-image, and behavior. When they broke up, Weems says that Marshall continued to harass her, spread rumors about her, and even broke into her house one night and crawled into bed with her. Marshall responded Wednesday in a post on his personal Tumblr page, stating that he would be “wrapping production” of the network so that he could take time to receive mental-health treatment. The statement is a sprawling tome that apologizes to Weems, applauds her for her bravery, attempts to explain his side of the allegations, publicly outs himself as queer, accuses Weems of telling others that fact without permission, tries to educate others on mental health topics, and includes a link to a podcast episode in which he interviews Buddhist teacher Jack Kornfield. The Sklar Brothers, who had recently started the sports-centric View From the Cheap Seats podcast as a companion to Dumb People Town, responded to questions on Twitter about their plans to be a part of a new network forming out of the ashes of Feral. They also shared their thoughts on the abuse accusations. For those wanting to know: Starburns is excited to announce the launch of SBI:Audio! SBI: Audio is the new podcast venture from #Starburns Ind. #Harmontown #DumbPeopleTown & more, will be migrating to the new service. We r excited 2 continue working w Dan Harmon and the SBI team. Starburns Industries, a production company that was one of the ownership partners of Feral Audio, officially announced the new network as well, presumably with the SB standing for Starburns. It’s unclear exactly which podcasts beyond the ones mentioned in the tweet will join the new network or when exactly Feral will cease operations. It does sound as though shows which stay with SBI will not see any interruption or issues with their feeds. Podcasting fans will be keeping a close eye on the fallout and where things go from here for their favorite shows and whether or not SBI: Audio lives up to the independent ideals set forth by Feral Audio.